There has been a great deal of sharing of client side techniques of late, so I thought I'd toss out a tip. A means to have a PE executable terminate and delete itself while running on a modern Windows system. The technique we will use is not new, but is one I discovered independently while tinkering with thread injection techniques a few years back. If you have worked with a modern Windows systems you are familiar, at least on an abstract level, that once an executable has been mapped to virtual memory you cannot delete the file from disk until the handle is closed. Self-deleting a "Persisted memory-mapped file" is often solved by writing a secondary script (.bat||.ps1||.vbs) to disk as a clean-up stub. A cleaner way to do this is to spawn a windowless process in a new process group and inject code to terminate the calling PE, and remove the file from disk. This post includes a purposefully verbose example written in python to attempt to clearly illustrate this technique. Since many people are familiar with the CreateThread function, due to it's popularity in shellcode execution, we will use the CreateRemoteThread function for our examples. The only difference people already familiar with CreateThread will notice is that CreateRemoteThread takes a process handle argument denoting the remote process into which we injected our code. 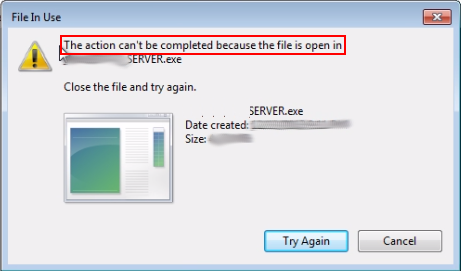 If you've ever attempted to delete an open file on a modern Windows system you are familiar with the following dialog. In order to terminate and delete a running PE we will use two things: the full file path and the current process id. If you are using an interpreted language, you may also wish to know whether the processes is running as a standalone script or from inside a packed executable. As many people are using Python with things like pyinstaller, p2exe, or cx_Freeze to pack up interpreted code. Creating code that works when run as a script or a packed PE can useful. In this example I use Thomas Heller's (ctypes and py2exe notoriety) suggestions found here to determine the state of the file, script, or exe. As this point of this post is clarify the deletion method and not about writing shellcode that calls DeleteFileA from kernel32.lib, I will use slightly modified shellcode from the Metasploit project's WinExec payload. I change the value of uCmdSHow to cause our commands to run without a visible window. The second part of our shellcode is a bit of a hack, but hopefully it makes things accessible and clear to the reader. Since we aren't writing our own shellcode, and don't have access to SleepEx, we use ping along with an unreachable address and a known timeout to create a sleep state. The purpose of this sleep is to ensure that the call to taskkill has completed terminating the primary process before we attempt to remove it from disk. In writing your own code you may choose to simply have the process exit() before removing the file. I find terminating the process to be a more aggressive form of removal when triggering this method of self-deletion on errors or signals. You can use any process for which you can request appropriate handle permissions, however, I recommend you open a new process that will not be interacted with by users. Additionally, be mindful of process load time when using thread creation flags that request immediate execution. For these reason I will use notepad.exe. There are four stages to our remote thread injection. First we must request access to interact with the remote process we are targeting as our cleanup helper via OpenProcess. Once we have a handle with appropriate permission, we allocate enough memory for our payload with VitualAllocEx. Now that we have a space to write our payload, we copy our buffer into the space using WriteProcessMemory. If the write succeeds, we can kick off our code with CreateRemoteThread. There are many ways to perform remote thread injection, those shown here are among the most common and easy to follow. Note: You can also start your helper process then inject a suspended thread that is triggered from your primary process based on later signals, exceptions, or states. I shy away from this as it leaves a larger footprint in the process list. When compiling code that uses this method, due to difference in size of PROCESS_ALL_ACCESS between windows versions, be certain to set _WIN32_WINNT || _WIN32_WINNT_WINXP appropriately. Alternatively, you can simply compile your code on a system relative to the oldest Windows version your code will target. The following code will self delete using remote threat injection as either a raw python script or when ran as an executable. I've tried to make the significance of each Windows function argument as clear as possible. Code on github. WinExec shellcode sourced from the Metasploit Framework. I encourage people to explore other methods of code injection and self deletion, there's lots of great tricks out there to be learned. Additionally, consider adding timeout dates to your client-sides that cause self-deletion to trigger before payload execution if a client-side is ever executed outside of scoped testing dates.